Jelly Bellies are the best! Licorice Jelly Belly beans are the best! Thirty-five per serving, 140 calories, all sugar and no fat! I've always enjoyed them, but they've been merely a delicious snack, an almost-dessert. Now, thanks to the tour Jon and I took at the Jelly Belly factory, I know oodles more. For instance, Gustav and Albert Goelitz were making precursors to the Jelly Belly beans back in 1869 upon their emigration from Germany. Their original recipes for a sweet which mimicked the classic Turkish Delight (something I've only ever heard of from the selfish, greedy little mouth of young Edward in The Lion, The Witch, and The Wardrobe ), strongly influenced the current classic candy. A single Jelly Belly bean, from conception to the day it is delivered to the distributor, takes almost a week to make. During this time it undergoes many, many steps (some of which involve the dexterous and efficient yellow robots). Spinning cylinders and conveyor belts and funnels and hoppers guide the Jelly Belly beans on a fantastic, colorful journey. At one point they take a sugar shower! There was a Jelly Belly gallery at one point in the tour. 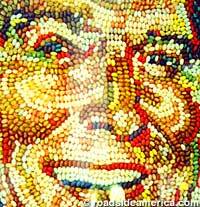 We could see portraits of famous folks (everyone from Marilyn Monroe to Elvis to Spiderman to Ronald Reagan) done entirely with beans! Not life-like, but interesting, nonetheless. Ronald Reagan was the first portrait subject ever. He had been a fan of Jelly Bellies as the governor of California, and when he took the big step up to the White House, the jar of Jelly Bellies came, too. The blueberry flavor was invented specifically so Reagan could be presented with a red, white and blue jar at his inauguration. And that's when Jelly Bellies became famous, an integral part of many holidays. Licorice was Reagan's favorite. And, though that fact alone would sway me (I'm a huge Reagan-ite), I have loved the little black licorice Jelly Bellies forever. When my church youth group went to camp in the summer of 1999, I met a guy named Josh*. He was a sweet guy, a couple of years older than me, and became my camp crush for the year. When summer ended, so did my attachment. (No, I wasn't fickle; I was realistic. He lived in Pacific Grove, and I couldn't even drive yet!) But his affection for me didn't fade so easily. One day I came home to discover a 3-pound box of licorice Jelly Bellies waiting for me. Dear Josh had remembered my favorite candy. He was leaving to join the Marines, and wanted me to think of him. That box lasted until Christmas! And I can honestly say I thought of him every time I took a handful. On the tour, we wore those delightful paper hats with the Jelly Belly logo on them. I think they were originally designed to keep peoples' hair from falling into the Jelly Belly process. Now, though, the tour goes through a series of human-sized hamster tubes. There is no human contact with Jelly Bellies until the very end when the nice tour guide hands you your pre-packaged free beans! Of course, this time the new set of Harry Potter flavors was included in the freebie. Disgusting flavors like booger, grass clippings and vomit among them. Jon sampled the vomit (a sentence I never thought I'd say). He gagged on it (shocking! ), and I wouldn't kiss him for an hour. We also purchased four bags of 'Belly Flops,' the less-than-perfect beans, unworthy of the Jelly Belly title. These beans are off-colored, stuck together, misprinted, misshapen and odd-sized. But they taste delicious anyway, and the Jelly Belly folks don't like to waste a single bean. They have even found a use for the several thousand beans that fall to the factory floor each day. A local pig farmer swings by to pick up the pile, and his pigs are treated to dessert! *This Josh is not to be confused with my brother-in-law, also a Josh, who I'm sure has great taste in candy, but was never my "camp crush". I felt this clarification was necessary, both because I am now related to a guy named Josh, and because our last name is Camp, which is where I was when I liked the other guy named Josh whose last name wasn't Camp. His last name was Turner, which probably, if mentioned before, would have saved me this long, blithering footnote. Oh well.